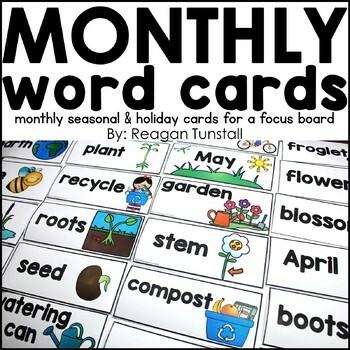 This product can be used to display monthly seasonal and holiday word cards and vocabulary on a focus wall or on a ring to be used in discussion, lessons, writing and more. There are 300+ words included. 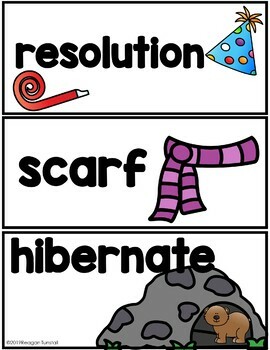 Use these cards in small group or large group to introduce, reinforce, or teach seasonal vocabulary concepts. 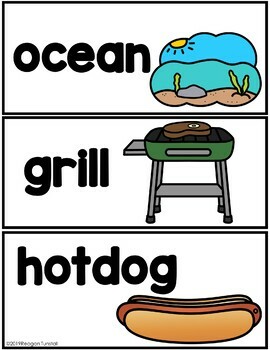 Have students alphabetize words or sort types of words like nouns, verbs, and adjectives. Students can write words to practice handwriting. Or they can use them as a reference for their writing pieces. Place on a Literacy Focus Wall, Writing Wall, Reference Wall, Literacy Word Wall, label items around the classroom, or simply place on a ring for students to use as a reference. These cards provide the word in a very legible and clear font with a matching picture of the word. The cards cover themes for every month, season, and holiday. Be sure to check the preview!